When Apple announced it was going to discontinue its professional image-cataloguing application Aperture, but that a brand new Photos app was on its way, many (including me) obviously hoped that Photos would go some way towards replacing our favourite application. These hopes were raised by early screenshots showing some powerful-looking editing tools. Well the dust has settled, Apple Photos has had time to ‘bed in’ and it’s become clearer how Apple intends its Photos ecosystem to work. It’s also become clearer, sadly, that Photos in no way matches what Aperture could do as a fast, professional and flexible image cataloguing tool. So this post is designed to do two things: (1) explain what the problems with Photos are and why it’s no Aperture substitute, and (2) explain why it is actually worth using, even if it’s for a different need than the one you might have had in mind. The editing tools in Apple Photos are really good, but it can’t even approach Aperture’s organisational tools. The editing tools are irrelevant. True, the tools in Apple Photos are rather good for beginner-orientated software, and they are non-destructive. But the editing tools were never the main reason for using Aperture anyway – they were useful for quick enhancements so that you could see an image’s potential, but you’d almost certain use an external editor or plug-in for any serious image-editing work. Apple Photos doesn’t support external editors and plug-ins. Yes, you can use ‘Extensions’ specially written by software publishers to work alongside Apple Photos, but Apple has forced developers into a new extensible architecture that’s specific to Photos and which, probably, won’t ever reach the level of support for Aperture plug-ins. Can you see Google producing Apple Photos Extensions for its Google Nik Collection plug-ins? It doesn’t support stacking. You can’t group together shots taken in a single burst, multiple edits of the same image, bracketed exposure sets or all the other groups of images you might want to keep together. You can’t create virtual copies. In other words, you can’t try out multiple variations on the same image – unless you duplicate the image first, which seems a waste of space. In fact, Apple Photos gives you no options for saving a new ‘version’ of an edited image. Your edits always replace the original photo, which is annoying. Only basic metadata can be stored: You can add keywords, descriptions, people and place information, but that’s it. 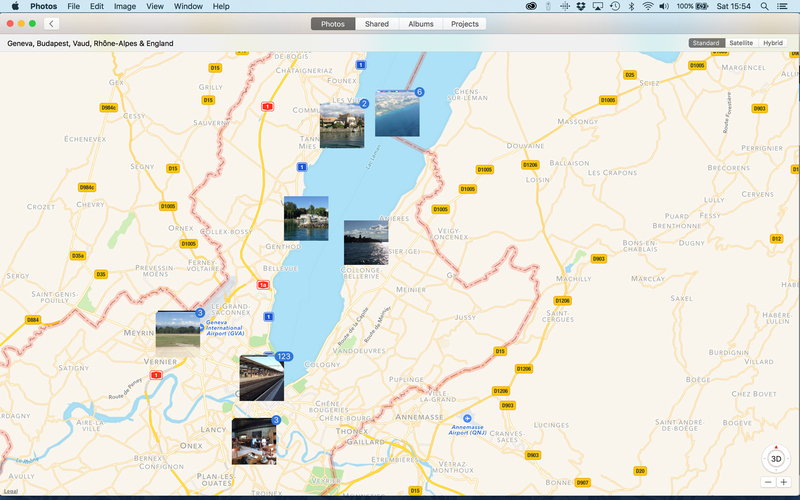 Apple Photos is not designed for professional asset management and any workarounds that got you even close to that would be time-consuming and likely to lead to such a distortion of your natural workflow that they were counter-productive. 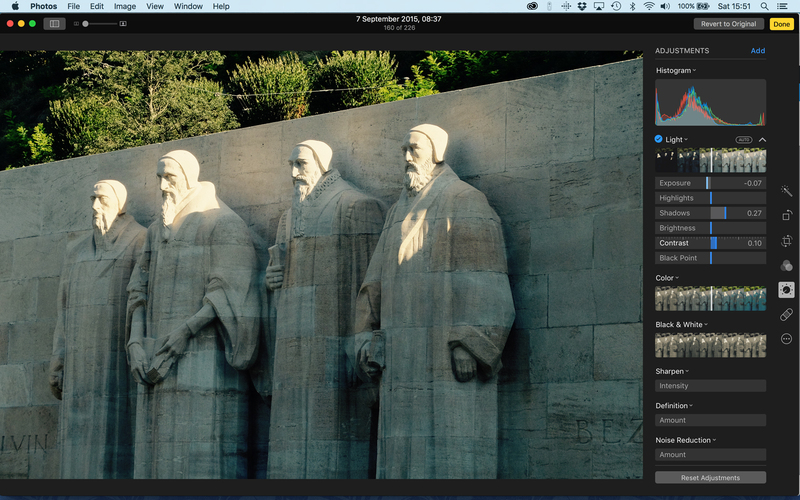 Don’t even try to shoehorn Apple Photos into Aperture’s role. Instead, just enjoy it as a simple family photo tool for saving, sorting and sharing your adventures. Clearly, Apple has designed Apple Photos as a ‘family’ photo management tool. It’s designed for casual photographers who want to know as little as possible about the technicalities, but want to get as much as possible from their pictures. That won’t cut much ice with expert photographers bemoaning the loss of Aperture, but that boat has already sailed and we have to get used to it. But it is worth thinking about Apple Photos for another purpose – that of storing and sharing all our personal photography with friends and family. Even expert photographers shoot for friends and family too, and we’ve all probably set up and managed different photo collections for doing this. So you can and should put Apple Photos out of your mind as a serious photo management tool, but here are some reasons why it is actually rather good as a family photography tool. It’s utterly undemanding. When you’re on holiday, or with the family, you shouldn’t still be acting like a pro photographer. If you use your iPhone to take pictures (a very good idea), they’re stored, sorted and archived automatically. If you use a regular camera, once you’ve imported your shots, they’re handled in the same way. Everyone will understand it. You won’t have to be the family’s 24-hour photography expert because the Photos app is about as simple to use as it can be. Admittedly, it looks a little quirky compared to regular photo tools, but once you all understand how it works, it all makes sense. Your photos are safe. If you use Apple’s iCloud Photos service, and I can’t think of a reason not to, your photos are not only backed up to the cloud, they’re available on all your devices, including your iPhone, your iPad, your Mac and even any other computer with an Internet connection and a browser. Sharing is simple. All you need to do is set up a shared album, choose who to share it with and start adding pictures. This does demand that everyone in your household or circle of friends has an iPhone, an iPad or an iCloud account, but these are common enough circumstances for Apple’s sharing ecosystem to make a lot of sense. Your edits are everywhere and reversible. If you crop a photo on your iPhone, it’s cropped when you look at it on your computer or your iPad (though, er, not always straight away). If you add a filter effect to a batch of photos on your Mac, this ripples through to all your iOS devices. And if you decide you’ve made a big mistake, you can easily undo your changes because all the editing tools are non-destructive. But there is a wonderful app that allows you to use many editors for Photos including Nik software, Aurora, ON! 10, Photoshop Elements and many others, alas not Lightroom. It certainly takes Photos to a whole new level. The app is called appropriately External Editors for Photos.It’s free from the Apple store. Try it– you’ll like it! Yes, that looks interesting, but it only extends the editing options in Photos, which aren’t really the problem anyway. It is true that the way Apple Photos is designed right now has clear limitations when using extensions. Images are saved in jpg format although you can always go back to the original, and you cannot go back to a previous point on your adjustment history, you will have to go back to the starting point with the original raw. But with apps like External Editors or Open In, which is free, you can also integrate it with more powerful plugins like the Nik software. Others, like Aurora or Polarr, can be used with both this system or integrated as their own extensions in Photos, although the presets you save in Polarr as standalone app won’t appear if you use the extension, for instance. (The workaround I found is to export and import them again on the Polarr extension). As Paul says, for me the third party apps that expand Photos extension have been a game changer. I absolutely the simplicity from Photos for organizing and displaying pics on timelines and albums (just a humble opinion as an amateur photograph, as I recognize that Lightroom has far more powerful options for pros). And its connection to iCloud to have it in all my devices. Also another advantage for me as an amateur photo-lover on a budget is that now the Nik software is free, so with the combo Photos + Nik I got a simple but powerful workflow with no cost. I feel completely identified with the frustration of Aperture being abandoned and was waiting patiently for Photos to replace it. But even with the many, many limitations it has right now, I can say that with this method I’m no longer missing Aperture. I’ve never understood why so many photographers abandoned Aperture after Apple stopped supporting it. It works just as well today as it did prior to Apple’s abandonment, and with plug-ins such as those from Topaz and Nik (available free of charge before Google sold Nik to DXO) it remains my “go-to” photo editing and cataloging App. Granted, there are many cameras who’s RAW files aren’t supported by Apple’s red headed stepchild, but Adobe DNG is free and will convert most any RAW file to a DNG file. It can then be brought into Aperture and edited as if Aperture were still supported by Apple. Other programs like Iridient Developer can develop the RAW file before importing into Aperture, but if the file is no longer RAW you’ll lose access to the RAW fine tuning Adjustments. As a DNG file imported into Aperture one can access the Raw Fine Tuning adjustment brick that allows for better highlight recovery than any program I’ve used to date. And if one of Apertures adjustment bricks is insufficient a second one can be added by simply clicking on the gear icon to the right of the currently used brick and add a new adjustment. I’ve never understood why Apple abandoned Aperture. I’m also at sea as to why Apple abandoned iWeb. Both were and still are the most intuitive and well designed Apps in the digital realm and show that whomever was charged with deciding to kill these Apps should have spent more time talking with photographers who used these Apps before deciding to kill them. Especially now that Apple has a Trillion dollar valuation!